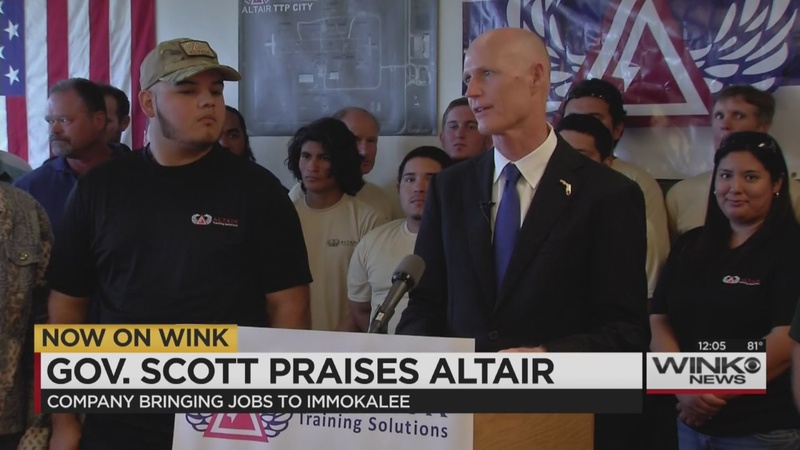 IMMOKALEE, Fla.- Governor Rick Scott is praising a local business for creating jobs in one of the state’s highest unemployed areas. Altair Training Solutions just got off the ground about eight months ago, but it’s transforming an old prison site to a new source of jobs and hope. Altair took over what once was the Hendry County Prison. When it closed in 2011, it left a lot of people without work. Now, the company is changing that, one job at a time. Gov. Scott visited the staff at Altair on Monday to congratulate them on creating 35 jobs in the short time it’s been open. The owners say they hope to hire another 10 people by the end of the year, and have 145 employees after three years. Altair provides training and services for specialized military teams and law enforcement. The owners say their dream wouldn’t be a reality without local and state support. “Because of the way he streamlined the red tape and made sense of the procedures we had to go through to make this happen, that’s why we’re successful today,” said CEO Brian Jones. The governor also presented several Veteran’s Service Awards to six members of the staff, including the two owners.